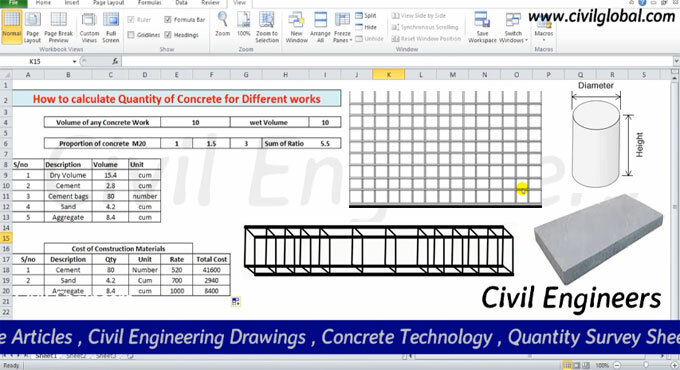 In this exclusive construction video tutorial Sami Ullah, the renowned engineer, has provided some useful tips to simply the calculation process for finding out the quantity of concrete for different works which range from column, beam, slab as well as road. The calculation is done through a excel sheet. In another section, there are different heads like serial number, description, volume and unit. The description part contains the heads like dry volume, cement, cement bags, sand and aggregate. Dry volume is calculated by multiplying weight volume with 1.54 (as it raises 54% of weight volume) i.e 15.4 cubic meter. To find out cement quantity, divide the ratio of cement with sum up of ratios and multiply with dry volume i.e. 1/5.5x15.4 = 2.8 cubic meter. To find out cement bags, cement volume is divided by volume of cement bags i.e. 2.8/0.035 = 80 numbers of bags. To find out the quantity of sand, divide the ratio of sand with sum of ratios and multiply with dry volume i.e. 1.5/5.5x15.4 = 4.2 cubic meter. To find out the quantity of aggregate, divide the ratio of aggregate with sum of ratios and multiply with dry volume i.e. 3/5.5x15.4 = 8.4 cubic meter. To learn the complete calculation process, watch the following video tutorial.